Sandwiched between international triumphs on consecutive weekends, Summerhill’s young stallion Admire Main, earned himself the title of Stallion Prospect of the Year, while Andrew Caulfield talks of other events which serve to highlight the burgeoning influence of the tribe. 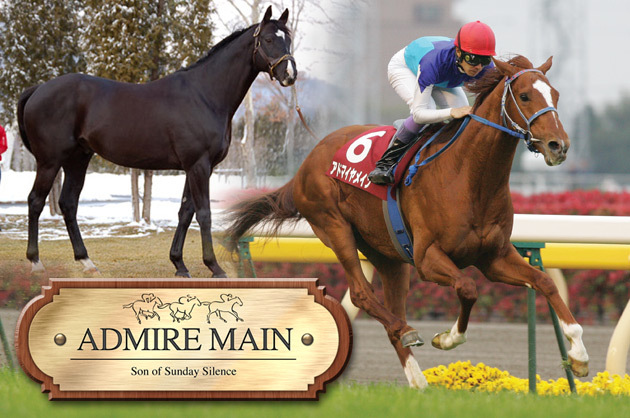 In last week’s article I paid tribute to the exceptional Japanese stallion Sunday Silence in reference to the top Japanese filly Meisho Mambo, a daughter of the Sunday Silence stallion Suzuka Mambo. Coincidentally, the same day’s issue of TDN carried the result of the G1 Grande Premio Diana, the Oaks equivalent at the Cidade Jardim track at Sao Paulo in Brazil. Here again it was a son of Sunday Silence, Agnes Gold—who supplied the decisive winner, Energia Fribby. By the end of the week two more sons of Sunday Silence had been represented by group winners, this time in their native Japan. First to do so was Fuji Kiseki, the horse who first highlighted Sunday Silences potential by becoming a champion 2-year-old from his first crop. Now a veteran of 21, Fuji Kiseki was responsible for Isla Bonita, who was scoring for the third time in four starts when he won the G3 Tokyo Sports Hai Nisai S. It is a measure of the dominance of Sunday Silences sons that they were responsible for nine of the first 10 finishers in this race—a race whose recent winners include Deep Brillante (2012 Japanese Derby), Sadamu Patek (G1 Mile Championship in 2012) and Rose Kingdom (G1 Japan Cup in 2010). This dominance was again in evidence in the following days G1 Mile Championship at Kyoto, with Sunday Silences sons again taking credit for the vast majority of the 18 runners. Five of them were by Deep Impact, while Daiwa Major and Dance In The Dark each had a trio of representatives. Between them Deep Impact and Daiwa Major sired the first five finishers, with Deep Impacts 5-year-old son Tosen Ra taking victory from Daiwa Majors 4-year-old colt Daiwa Maggiore. Deep Impacts earnings from the Mile Championship helped stretch his lead over King Kamehameha on Japans sire table to nearly -570,000,000—that’s heading for $5,700,000. This means there is every chance Deep Impact will take his second consecutive sires championship, especially as his daughters Gentildonna, Verxina, Lachesis and Denim And Ruby are among the nominations for the Japan Cup. Deep Impact owed his 2012 championship to a worldwide total of 14 individual graded/group winners and he is again among the leaders in this category. His total of 12 places him joint-third with Dansili and Giants Causeway, behind Galileo and Dubawi. Incidentally, anyone who shares the widespread prejudice against mile-and-a-half horses should take a look at this graded-stakes winners table. The clear leader, Galileo, was at his best over Europe’s traditional classic distance and the leaders also include his fellow mile-and-a-half winners Kittens Joy, Monsun and Montjeu. Deep Impact stayed even better, and I can’t help wondering how breeders would have reacted to him had he started his stallion career in Europe or the U.S. Connections of Europe’s leading mile-and-a-half horses are usually desperate for them to add a Group 1 victory over a mile and a quarter to their C.V., and a victory in the St Leger can sound the death knell to a colt=s appeal as a stallion. So what would they have made of Deep Impact’s record, which also lacked the much-desired notable performances at two? Admittedly he did win as a juvenile, but he didn’t make it to the races until Dec. 19, when he won a mile-and-a-quarter newcomers race at Hanshin. Deep Impact proceeded to remain unbeaten in his first seven starts, his seventh win coming when he completed the Japanese Triple Crown with victory in the Kikuka Sho (Japanese St Leger) over 1 7/8 miles. His stamina was again thoroughly tested at the start of his 4-year-old campaign, when he recorded clear-cut victories in the G2 Hanshin Daishoten over 1 7/8 miles and the Tenno Sho (Spring) over two miles. He never tackled a distance shorter than a mile and a quarter. Of course, he was bred to stay pretty well as his dam was tried at up 13/4 miles—a distance over his second dam Burghclere was successful. The mere fact that Deep Impact has sired two winners of the Oka Sho (1000 Guineas) and one of the French 1000 Guineas tells us that breeders have succeeded in injecting speed into his progeny. So does the fact that he had five representatives in the Mile Championship, out of daughters of Lycius, Caerleon, Bertolini, Smart Strike and Meadowlake. Tosen Ra, the Mile Championship winner, is out of Princess Olivia, a Lycius mare whose name is already well known in America as the dam of Flower Alley. She was sold for $825,000 in November 2005, and would no doubt have made a lot more had she been in foal to a more fashionable stallion than Monashee Mountain. She came on the market not long after Flower Alley had been in fine form at Saratoga, where he followed up an easy win in the GII Jim Dandy S. with a victory over the Kentucky Derby favorite Bellamy Road and the GI Haskell Invitational winner Roman Ruler in the GI Travers S.
Tosen Ras Group 1 victory at Kyoto came on his first venture over a distance as short as a mile, even though he had won both his starts over his next-shortest distance of a mile and an eighth. As he has won only one of his 17 races over longer distances, anyone could be excused for thinking that this was because he was racing beyond his optimum distance. This can’t be so, though, as he finished third behind the top-class Orfevre in the G1 Kikuka Sho over 1 7/8 miles in 2011. Then, earlier this year, he contested the two-mile version of the G1 Tenno Sho and ran extremely well to take second place behind Fenomeno in an 18-runner field. He finished two lengths clear of Red Cadeaux, an accomplished international performer who recently came out the best horse at the weights in the G1 Melbourne Cup. How many horses are capable of Group 1 performances over such different distances as a mile and two miles in the same season? Incidentally, Tosen Ra is a perfect illustration of the debt Japanese breeding owes to imported mares. Not only is he out of an imported mare, but so is his sire Deep Impact. A quick look at this year=s top ten earners in Japan also reveals that he is one of six which are either out of imported mares or mares conceived abroad. The others are Lord Kanaloa and Kizuna (both with dams by Storm Cat), Hokko Tarumae (dam by Cherokee Run), Fenomeno (dam by Danehill) and Just A Way (dam by Wild Again).